Richard Proudfit was born and raised in St. Paul. When he was growing up his father was a chef and owned his own restaurant. When Richard was in elementary school he had a habit of never taking no for an answer. In high school he was very good at basketball. During college he majored in engineering and business. In the 1960s, Richard Proudfit started his business literally in his own garage. Richard's obsession with feeding starving children began when he went on a medical trip to Honduras after Hurricane Fifi, which left thousands dead or homeless. This event is also where he said, "God has called me to feed starving children. I have to do that first, then when I have activated their bodies, I can do other things." After he came back from Honduras, in 1979 he founded Kids Against Hunger, which is a food organization that packages rice, vitamins and minerals, and vegetables to be sent to kids and adults around the world. His lifetime commitment is to solve enormous world problems. Mr. Proudfit knew that his vision of feeding starving children required a fast packaging organization for the high demand of food all over the world, as well as a manual packaging process. Since Kids Against Hunger opened, there have been over 10,000 volunteers who have packaged and delivered over 75,000,000 meals across the globe. Kids Against Hunger is a nonprofit organization, with 6 locations in the USA. Richard Proudfit has been paying for some of it out of his own wallet. It is a big success for an 80-year-old man! Richard's goal in life is set very high. The food his organization packages and delivers mainly feeds children under the age of 5 because starvation affects them the most. 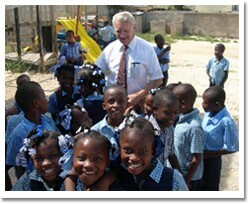 Richard Proudfit is now 80 years old and still has these big dreams of saving kids and adults around the world. Every time he is asked whether he will retire or not, the answer is always the same, "I can't, my children are dying." Richard Proudfit is a hero to me because he has done many things to help many kids. 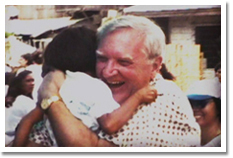 Before Kids Against Hunger was started, he was in Honduras to help kids who were sick. Starting Kids Against Hunger in his garage, then having it grow to be a successful organization that uses volunteers to package food, is admirable. With his 6 plants around the world he has been able to feed millions of children. That is why Richard Proudfit is my hero! Kids Against Hunger - This organization packages food for kids who are starving in countries around the world. Hurricane Fifi - This hurricane caused over $900 million in damage.